What are the best things to do in Città di Castello? Here you can find a mini-guide to know the things to see and typical food of Città di Castello. The symbol of Città di Castello is without doubt the group of towers that makes the city instantly recognizable and that represent a " summa " of its own historical events, strongly characterized by the contrast between the civic and religious power. As evidence of the medieval past , in some places you can see the double walls , still intact in many places. Let's begin our tour from Porta San Giacomo and continue in the old town where you can admire Palazzo del Podestà which preserves intact one side, towards Corso Cavour, adorned with nine times open lancet lancet lunettes enriched with coats of arms and friezes, stone, ground floor and a series of beautiful mullioned windows on the main floor . A wider arch archway marks the entrance to the Palace and communicates with the seventeenth-century porch that opens onto the beautiful Piazza Fanti. The facade of the palace on Piazza Matteotti appears neoclassical and was finished by Nicola Barbioni in 1687. Characteristic quadrant of the Rosa dei Venti which also houses a dual clock hours and minutes. The guide on things to do in Città di Castello can not miss Piazza Matteotti , the "center of the center" of the city. The Civic Tower suggestive of the thirteenth century , which differ from other prismatic , retains some walled stone coats of arms and the track that the Priors commissioned the fresco by Luca Signorelli in 1474 . Symbol of municipal power (it was also used as a prison ) the Tower is known as the " Bishop's Tower " because it united with the Bishop's Palace, rebuilt several times until you have the actual eighteenth-century appearance . Among the things to do in Citta di Castello you can not miss a walk up to the summit of the Bishop's Tower to enjoy the incomparable view of the old town , on the green hillside and the valley. 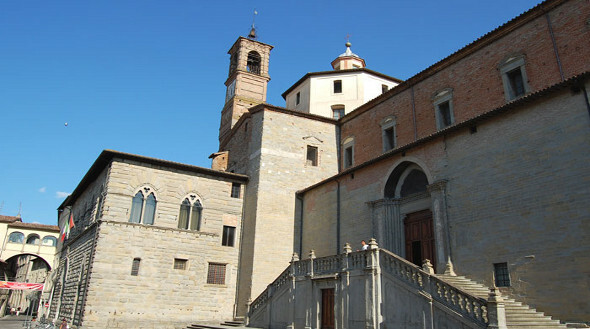 Other points of interest in the city are The Cylindrical Tower , the Cathedral of San Florido and the Town Hall . If you love art we have no doubt in the tips on things to do in Citta di Castello since the city can boast two outstanding museums : the Burri Museum and Art Gallery. 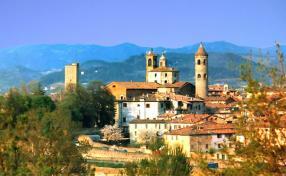 There are offers for vacation rentals and hotels in the areas of Città di Castello! Click and Consult them immediately. The works of the famous artist Alberto Burri are partly in Albizzini Palace which houses 130 works as Tar , Mildew , Gobbi , Sacks, Woods , Irons , Combustion , and Cretti Cellotex, and partly to the Ex Essicatoi . This industrial complex, built between the late 50s and mid-60s of the twentieth century for tropical tobacco drying, has been converted into a museum allowing the exhibition of paintings of unusual size , further donation of the artist to his city. 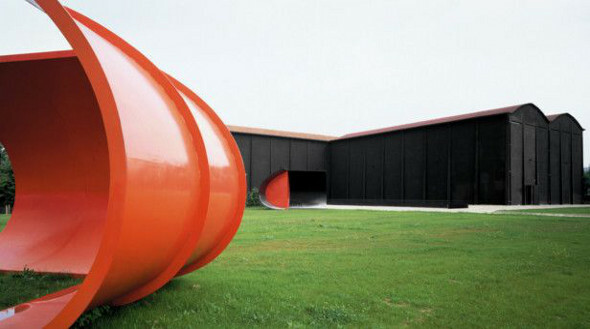 The exhibition space , opened in July 1990, houses 128 works created from 1970 to 1993 , including series of paintings and sculptures, also placed on the lawn outside. If after so much art and so much culture you experience a languor in the stomach , our mini-guide recommends what to eat in Città di Castello. A typical dish of Città di Castello is the " baggiana ", a soup made of beans, tomatoes and basil, which can accompany the tigella, a small flat bread made with flour , water and salt , which is usually eaten stuffed with ham , mortadella and cheeses . See the best restaurants in the area of Città di Castello! >> Click here and book. Fans of truffles you will not miss the Città di Castello White Truffle, available in the markets from late October. If you find it ( it's not easy! ) bring home "Pecorino matured in barrels" in which the various types of herbs that are added to the curds , as well as giving clear aromatic , help to reduce the bacterial load of milk without affecting aromas that are then transmitted to the cheese during ripening. 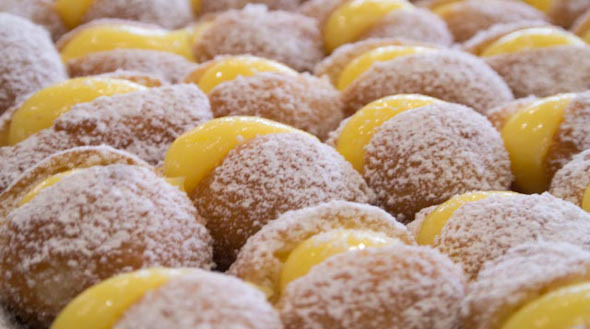 If you come in Città di Castello during Carnival you can taste castagnole, delicious with honey or cream. If you've decided to visit Città di Castello and taste Umbrian cuisine you should contact now Farm-Houses near Città di Castello >> click this link.